During the winter, we all need to prepare for the colds and flu it brings about. Respiratory conditions are quite common during this season, so you can save a lot of energy and visits to the doctor, if you know a way to prevent them. Also, often after the cold days, we suffer from a persistent cough that lingers on for weeks on end and can be extremely irritating. Of course, you probably know hundreds of existing over-the-counter medicines that promise to relieve your cough. However, we all know that there is nothing better than an effective home remedy. Consequently, we will now offer you a way to avoid all those medications and cough drops, and use a natural cough inhibitor instead. What’s more, it is far more effective than the store-bought versions! 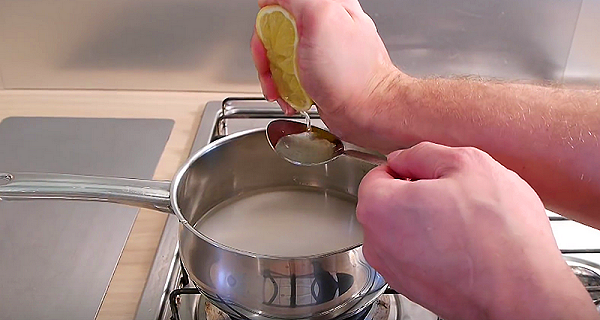 Mix the following ingredients in a small saucepan and bring the mixture to a boil. Then, simmer until you get a syrupy consistency and let it cool. When the mixture cools, mold into drops. All the ingredients used are extremely health beneficial as they effectively relieve persistent coughs. Cloves are abundant in antibacterial properties and reduce mucus, ginger supports your immune system and relieves pain and nausea, lemon juice is abundant in vitamin C and honey is a powerful antiseptic and a natural cough inhibitor.